Here are some easy tips on how to grow Colocasia plants: These tropical beauties grow best in temperatures of 68-86 degrees F. Any exposure to 50 degrees or below may damage them. Plant the bulbs 2-3 in. below the soil; lay each bulb on its side. Space bulbs 2 ft. apart. Make sure the soil is rich in organic matter. Soil must also be very loose and well draining. Colocasia plants like wet soil, so keep the soil moist and keep the plants mulched. Description: In North America this tropical beauty is grown for ornamental use: the heart or arrow-shaped leaves are showy and beautiful. 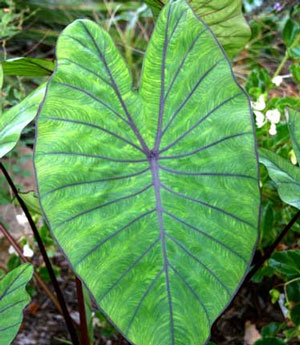 Colocasia plants have large (8-60 in.) leaves in dark, glossy green or dark plum. The green, dark red or black stems grow from 3-7 ft. tall. Elephant Ear plants can also be variegated. In their native lands, these annual plants are grown as perennial plants and the roots are eaten. Propagation: Root division in winter or early spring. Sun/Light Needs: Full sun to part shade. USDA Zones: 8-11 In Zone 5 and cooler, grown as annual plants. Fertilizer Needs: Every 3-4 weeks with a general fertilizer. Maintenance: Medium to high. Keep soil moist at all times. Keep mulched with organic matter: bark or pine needles are best. Companion Plants: Caladium, Coleus, Licorice plant. Display: Borders, containers, water gardens. Diseases/problems: Aphids, whiteflies, mosaic virus, root rot. 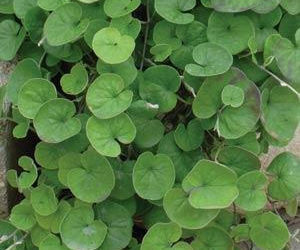 Colocasia plants are invasive in some areas; check with your nurseryman. The sap will irritate skin, so be careful handling the stems. Interesting Note: In Hawaii, the dish called Poi is made from the roots of Elephant Ear plants. Colocasia plants are thought to be the oldest cultivated plants in the world. When Should You Sow Tomato Seeds? Why Apply Garden Gypsum Now?